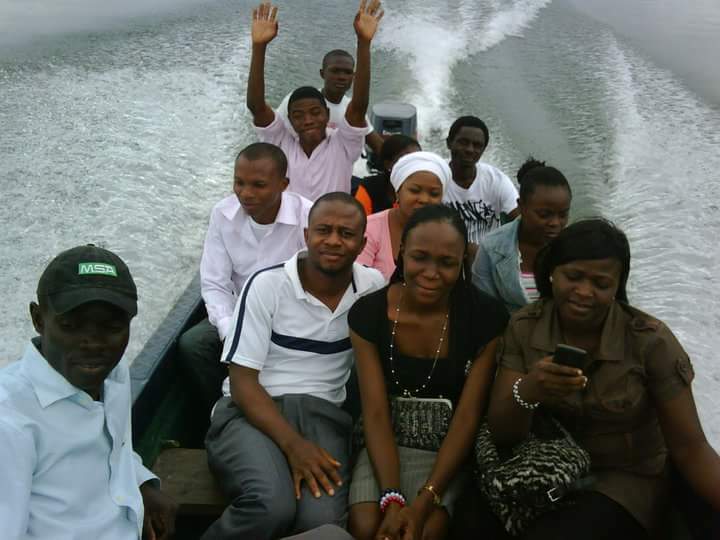 A failed picnic but a fun boat ride at Oguta lake. Oguta lake is located in the town Oguta in Imo state southeastern Nigeria, It is the largest natural lake in Imo State and the second largest in Nigeria if am not mistaken. long before i relocated to Imo state, i have been hearing of the lake and dying to visit there. When i finally relocated to Imo state i tried severally to visit the lake but one think or the other kept holding me back. Two years after i came to Imo state i never set my foot in Oguta but that dream never died. The thing was that i wanted it to be fun for me but i cant have fun alone, each time i tried to visit the lake alone so many things keep coming to my mind, so i decided to talk to a friend who accepted to go with me, while we were talking about it two of our friends came around and heard of our discussion and said they where going too, so we planned a picnic, and fixed a date. Three days before our picnic, a friend of our chika heard of the picnic and indicated interest, so the number rose to five. Everything was ready and we all were excited and looked forward to that day. On the day of the picnic i called Iyke to find out if they were set and he told me they were and they will be out in an hour or two hours time. I waited for them but didn’t hear anything, three hours went bye and i decided to go to their area, on getting to Iyke’s house i saw chika and mercy but chidi and Iyke was no where to be found, when i asked chika she told me that Iyke went to see chidi who was sick. well, i went to chidi’s place and found out that he wasn’t feeling too fine. Iyke wanted a reschedule which i accepted but on a second thought, if i didn’t visit the Oguta lake that day, i wouldn’t have visited it again because i had less than three month to stay in Imo state but i went home to undress, i wasn’t happy but there was nothing i could do about chidi’s health. In my anger and frustration i kept asking my self why chidi had to indicate interest to join us only to fall sick on that day, at least if he hadn’t indicated interest to join us we wouldn’t have been that worried about his health and we couldn’t have cancelled the picnic. When i got home, i just didn’t know what to do, i was demoralized but after an hour, i took my bag, put on my cloth and left for Oguta. Although i wants happy going alone but i had to, i will be more satisfied going there without doing anything thank leaving Imo state without going there. Finally i got to Oguta. beautiful, peaceful and very calm town with lovely and hospitable people. i took a walk around the town and after visiting few places i went for a drink and after that i asked for direction to the lake, and they directed to where i took a boat to the other side of the lake, i noticed that there was an event going on at the other end of the lake and the boat pilot or sailor or what ever name the person that steer a both is called thought i came for the event and took me there, well i joined the event and it was great, all through the time i was there i forgot that i came alone because i had a lot of fun, i also meet a group of students from Imo state university and Nekede that came for picnic. i also meet few families that also came for the same thing, Oguta that day was filled to the brim and i was glad i went there that day, although i wasn’t 100% happy but i was happy i didn’t spend that day at the lake alone. After the event we went for boat ride, i had to join several group for the ride. We toured the lake but before then we drove to the conference of Ogbuide(oguta) and Orashi, we saw where the two river met but didn’t mix up with each other. I have been hearing of it but never saw it but that day i finally saw it and i was satisfied. I was ready to go to Onitsha from Oguta that day but the group i was with when our sailor proposed we take our adventure further were scared but i cant blame them because it was getting late and they were students. even thought i didn’t want the fun to end but it had to, after the boat ride i headed back to Owerri. That day was memorable and perfect and i want to do that again. Well, after that day, the opportunity to visit Oguta lake never presented it self again till i left Imo Stata. I don’t know when next i will be visiting Imo state but when next i do i will surely let them know because i will love to have that picnic with them, some of them have been asking me to visit Owerri but i don’t have anything that will take me to Owerri at the main time and beside two of those my pals aren’t in Owerri but as soon as they return, i will make my way to Owerri for a very fun and memorable picnic at Oguta lake. Looks so beautiful! I would love to visit and do the same boat ride! That sound like a very cool adventure. i will like to experience that someday.